Ravi Shankar (1920~) 來自印度,他是孟加拉印度西塔琴樂手和作曲家,也是 Baba Allauddin Khan (1862–1972,創立印度斯坦古典弦樂流派 Maihar Gharana) 的門生. Ravi Shankar 是近代史上最具領導力的西塔琴樂手之一,有很長一段時間他與 tabla 鼓手 Pandit Chatur Lal 和 Ustad Allah Rakha 合作,並斷斷續續與 Sarod 樂手 Ali Akbar Khan 合作,其他合作過的樂手包括小提琴手 Yehudi Menuhin,印度製片人 Satyajit Ray 與披頭四 (特別是 George Harrison),增添彼此國際聲譽. 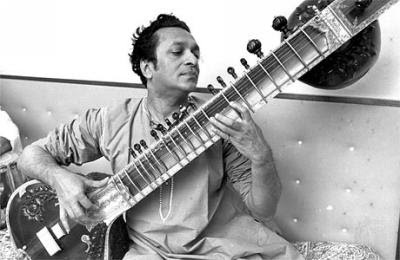 1999 年 Ravi Shankar 獲頒巴域維那 (Bharat Ratna) 獎章,這是印度最高榮譽的公民獎. 大他二十歲的胞兄 Uday Shankar (1900-1977) 是赫赫有名的舞蹈家, Uday 的兒子 Ananda Shankar 也是有名的音樂家, Ravi Shankar 的女兒更出色, Norah Jones (1979~) 是享譽國際的爵士歌手, Anoushka Shankar (1981~) 繼承父親技藝成為西塔琴樂手,她們是同父異母的姊妹, Norah Jones 的母親是 Sue Jones,而 Anoushka Shankar 的母親是 Sukanya Shankar. Ravi Shankar 不僅師事 Allaudin Khan,還和老師住在一起, Allaudin Khan 將他視如己出,這種良師益友的關係是傳統印度古典樂的典型範例, 1939 年 Ravi 在印度首次公開表演,正式音樂訓練於 1944 年結束,他在孟買獲得成功, 1946 年開始為電影撰寫配樂,例如 Satyajit Ray 的 Apu Trilogy 與 Richard Attenborough 的 Gandhi. 同時與 HMV 的印度成員展開錄音生涯, 1950 年代 Ravi 擔任 印度新德里廣播電台 (All India Radio) 音樂總監, Ravi 逐漸在國際舞台嶄露頭角, 1953 年首次到蘇聯表演, 1956 年登陸西方世界,他在許多大型音樂會中表演,包括愛丁堡音樂節與皇家慶典音樂廳 (Royal Festival Hall). 相較於其他古典樂手, Ravi 還參與過許多不凡的音樂活動,如 1967 年在加州蒙特瑞舉辦的蒙特瑞流行音樂節,他與 tabla 手 Ustad Allah Rakha 一同演出 ; 1969 年參與 烏茲塔克音樂節 ; 1971 年與 George Harrison 舉辦 孟加拉共和國音樂會,旨在慰藉東巴基斯坦日漸增加的難民,這裡是 Shankar 的故鄉 ; 1974 年 Ravi 與朋友領銜出席 Harrison 在北美的巡迴. 1997 年 Ravi 與 Harrison 合作最後一張專輯 Chants of India,當時 Harrison 對吟誦音樂 (Chant Music) 產生興趣, 2001 年 Harrison 罹患癌症往生,隔年 Shankar 與女兒 Anoushka,還有 Paul McCartney, Ringo Starr, Jeff Lynne, Eric Clapton, Tom Petty, Billy Preston 等人出席在倫敦舉辦的 Concert for George 逝世週年紀念會. Ravi 影響西方世界接受印度音樂,功不可沒,不過有一回他在三蕃市 Haight-Ashbury 區表演後寫道 : 我感到生氣與驚訝,印度文化竟被如此膚淺地對待與剝削.瑜珈,密宗 (Tantra),真言,拙火 (Kundalini),印度大麻 (ganja), Hashish (印度大麻提煉的麻藥),印度愛經 (Kama Sutra) ? 這些文化成為飯後甜酒的一部分,大家爭相囫圇吞棗. Ravi 曾為西塔琴與管弦樂譜寫兩部協奏曲 : Concerto for Sitar & Orchestra (Ravi Shankar 與 Andre Previn, 1971 年 BGO 發行) 與 Räga-Mälä (Sitar Concerto No. 2) (1982 年 Angel 發行),參與樂手包括 Yehudi Menuhin (小提琴), Jean-Pierre Rampal (法國橫笛手), 山本邦山 (Hōzan Yamamoto,日本尺八大師) 與 Musumi Miyashita (箏). 此外 Ravi 為印度,加拿大,歐洲,美國製作電影配樂,如 Chappaqua (回到查巴克, 1966 年), Charly (1968 年), Gandhi (甘地傳, 1982 年,獲得奧斯卡金像獎提名) 與 The Apu Trilogy (阿普三部曲, 1955-1960 年). 1987 年在 Private Music 旗下發行的專輯 Tana Mana 結合傳統樂器與電子音樂,形成新世紀曲風. Ravi 影響極簡大師 Philip Glass, 1990 年他們合作專輯 Passages,共收錄六首歌曲,兩位大師各自為專輯譜寫三首曲目,另外 Ravi 還為 Glass 於 2004 年發行的專輯 rion 編寫西塔琴旋律. Ravi Shankar 已是 88 歲的阿公,他有三個家,分別是加州的 Encinitas ; 紐澤西的 Warren 與新德里. Ravi Shankar 是美國國際現代音樂交流會 (International Rostrum of Composers) 的榮譽會員,他得過許多來自印度與世界各地頒發的榮譽獎,包括 14 個榮譽學位,如印度公民成就獎章 (Padma Vibhushan), Desikottam,馬尼拉的 Magsaysay 獎,三座葛萊美獎,日本的福岡 (Fukuoka) 文化獎,達沃斯 (瑞士日內瓦) 的全球大使水晶獎. 1982 年 Ravi 與 George Fenton 因為甘地傳共同獲得奧斯卡金像獎提名 ; 1986 年 Ravi 獲得印度上院聯邦院 (Rajya Sabha) 六年制的議員提名名單, 1998 年他與 Ray Charles 共同獲得普拉音樂獎 ; 2002 年 Ravi 受頒 Bharat Ratna (印度室內音樂終身成就獎). 1968 年 2 月 29 日『第十屆葛萊美獎』, Ravi Shankar 與 Yehudi Menuhin (曼紐因) 的 West Meets East 獲得『最佳室內樂表演獎』, Yehudi Menuhin (曼紐因, 1916-1999) 是旅居各地的小提琴家,在紐約出生,父母親是俄羅斯與猶太裔, 1970 年他成為瑞士公民, 1985 年又成為英國公民. 胞妹 Hephzibah Menuhin 是鋼琴家與人權運動提倡家,另一位胞妹 Yaltah Menuhin 是鋼琴家,畫家與詩人,曼紐因三歲便在 Sigmund Anker 教導下開始接觸小提琴,七歲與舊金山交響樂團演出,他擔任小提琴獨奏,二次大戰期間曼紐因與布烈頓 (Benjamin Britten, 1913-1976) 為貝爾根-貝爾森集中營 (Bergen-Belsen concentration camp) 的戰俘表演. 1962 年曼紐因在英國 Surrey 的 Stoke d'Abernon 創辦 曼紐因學校,教導 8 至 18 歲的學童學習古典音樂, 1965 年獲得榮譽爵士勳章,曼紐因的學生有 Nigel Kennedy,匈牙利小提琴家 Csaba Erdelyi 與 Paul Coletti. West Meets East 共分成三張專輯 : Album 1 (上圖左) ; Album 2 (上圖右) 與 Album 3.黑膠收藏者需要分三次收藏, cd 樂友可收藏合輯版本 West Meets East: The Historic Shankar/Menuhin Sessions,內容將三張專輯一網打盡. zeus began his DJ career since 1994, he held a residency position at Taipei's commercial clubs for 6 years. before discovering the more futuristic sounds like Warp, Detroit techno and Chicago house, a 2-year term he was a supervisor of a record company in the daytime and party all night. these sounds led him started collecting vinyl in 1996, two years later he got involved in vinyl importation, but the trading stopped in 2000. nevertheless he keeps building up his collections and more than 10,000 copies today. his style has over the years developed to any genre of music. Not only a vinyl collector, he's writing a chinese blog introducing artists oversea, in 2004, he hooked up with Lim Going, who is a legendary Taiwanese producer, and Stingrays - a well known techno producer & dj who comes from Singapore and based in Kaohsiung. they team up with a name called 'combination research'. He moved to Tainan in 2008 and found his own record store.